Be the first to share your favorite memory, photo or story of William "Ronnie". This memorial page is dedicated for family, friends and future generations to celebrate the life of their loved one. 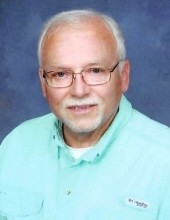 William Ronald “Ronnie” Allen, 73, of Fayetteville passed away Monday, April 15, 2019. He was born on March 17, 1946 in Augusta, Georgia to the late William Comer and Ruby Iola Allen. Ronnie was a loving husband, daddy, Poppa, brother, and uncle that will be greatly missed by all who knew him. Ronnie is survived by his wife of 53 years, Peggy Allen; son Rodney Allen; daughter, Brandy (Brian) Nelms; grandchildren, Caitlin and Sydney Nelms; sister, Beverly (Bill) Hudson; sister-in-law, Junnifer Jones, and niece, Leslie (Cory) Newcomer. A graveside service will be held at 11:00 AM on Wednesday, April 17, 2019 at Pleasant Grove Cemetery, 6390 Church Street Riverdale, Georgia. The family will receive friends from 6:00-8:00 PM on Tuesday, April 16, 2019 at Mowell Funeral Home, Fayetteville. In lieu of flowers, the family requests donations to North Fayette United Methodist Church, www.nfumc.com. To send flowers or a remembrance gift to the family of William "Ronnie" Ronald Allen, please visit our Tribute Store. "Email Address" would like to share the life celebration of William "Ronnie" Ronald Allen. Click on the "link" to go to share a favorite memory or leave a condolence message for the family.